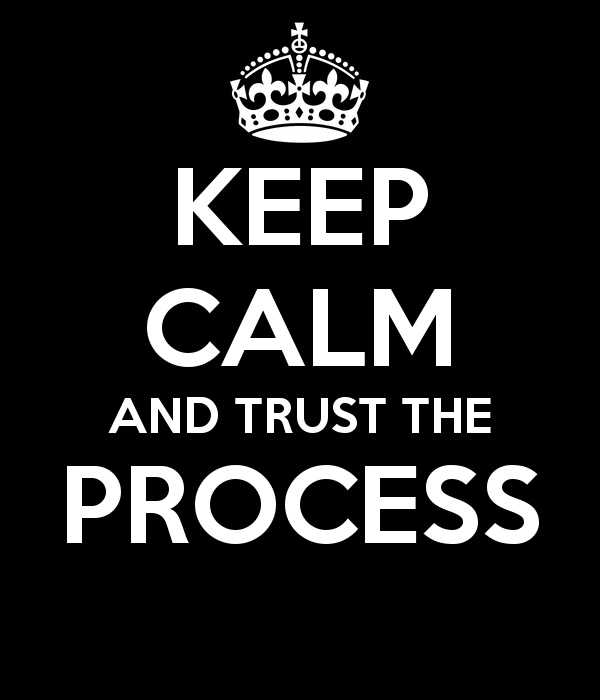 The Gift of Truth, Inc.: Trust the Process! Well, it's almost 12:00 am and I'm up blogging! LOL. I just felt the need to share this with you all before I went to bed. Last night, I had the opportunity to teach bible study at my church and I taught a lesson entitled, "My Journey Was Rough But It Was Worth It." Basically the Lord wanted me to encourage believers and let them know that everthing was working for their good. In this message, I talked about "trusting the process" which is a really common saying in practioces such as 12 steps and yoga. I thought I'd share some points from my message! Sometimes life can seen unfair...Bad things happen to good people while good things seemingly happen to bad people. Our question shouldn't be WHY but HOW? How did I make it through what others died in? How did I not lose my mind? How did I keep praising God when everything else was crumbling around me? The Lord wants me to encourage you today... everything that he allowed was purposeful! Romans 8:28 KJV "And we know that all things work together for good to them that love God, to them who are the called according to his purpose." We have to see God not just as a judge but a father...a good father. Everything he does for us, he does with the best intentions. It was rough...it hurt...it didn't seem fair BUT IT WAS WORTH IT! You would not be who you are today if that hadn't happened! You wouldn't know God the way you do if that hadn't happened to you! Job 23:8-10 NIV “But if I go to the east, he is not there; if I go to the west, I do not find him. When he is at work in the north, I do not see him; when he turns to the south, I catch no glimpse of him. But he knows the way that I take; when he has tested me, I will come forth as gold." You may be going through something and it seems as if God is no where to be found but HE'S WORKING BEHIND THE SCENES ON YOUR BEHALF! Only God can turn molestation into a miracle, tragedy into triumph, and destruction into destiny! Only God can turn mourning into dancing, pain into power, and failure into faith! Only God can turn a pit into a palace, a shepherd into a king, and a murderer into a apostle! Romans 8:18 NIV "I consider that our present sufferings are not worth comparing with the glory that will be revealed in us." Present suffering produces future glory! Notice the scripture says, "the glory that will be revealed in us" Sometimes the glory is not in what you receive externally but what God performs internally (IT'S AN NSIDE JOB)! It's what's produced on the inside that sustains you! Houses, cars, and money can't sustain you like peace, joy, integrity, and wisdom can. When you trust the process, you trust that eveything that's happening is working for a greater good. Trusting the process is continuing show up! The process doesn't change...you do! (Someone wrote this regarding yoga) "Three months ago, I couldn’t touch my toes. Now, I’m practicing headstands. What made the difference? I committed to the work and trusted the process. The process never changed: show up five times a week, practice hard, receive feedback, press in to the discomfort. This continual discipline of showing up and giving it all I had changed me, helped me exceed my own expectations." The process makes us flexible in the hands of God! 2 Corinthians 4:17 NIV "For our light and momentary troubles are achieving for us an eternal glory that far outweighs them all."